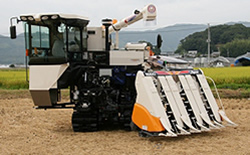 Combine harvester HJ6120 named "Japan" is the opening of new generation ISEKI combine which gave Japanese pro-farmers a impression by the appearance, high precision, performance and durability. In response to professional expectation under the severe condition, reaper unit adopts a Y character type conveyance method of cut paddy. 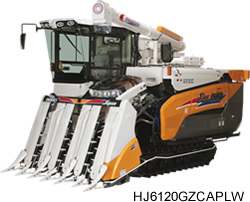 It also enables shifting of pick up speed of paddy without stopping a combine during work. 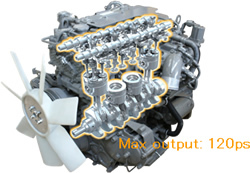 120ps high power, common rail engine can be controlled precisely, which brings high efficient and environment-friendly harvesting. With only ISEKI's big feature, "Twin-eight-thresher" system with three drums provide with efficient threshing and enable 2.0m/s operating speed. 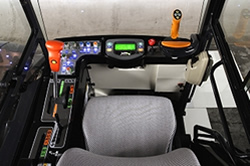 Levers and monitor are located on best position by work to concentrate operation and reduce the operator's fatigue. Deluxe cabin with bigger curved surface glass and big halogen working rumps improves visibility and operator's comfort even after dark. Full opening system allows easy and speedy maintenace. 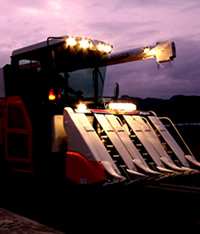 Not only access to thresher unit by opening cover, operator can also access to engine and reaper easily by opening cabin and reaper unit.